Laser are used in production of solar modules, such as scribing, edge deletion, drilling, etc. Due to their high flexibility in beam shape InnoSlab lasers are tailored tools for different processes. To increase the output voltage the large active surface of thin film solar is portioned by laser selective ablation process. InnoSlab lasers with short pulse length and top-hat beam profile is the most efficient tools for ablation of thin film . Fig. 11 shows example of line scribed by a square top-hat beam. The fundamental (1064nm) and the second harmonic are commonly used for the P1 and P2 and P3, respectively. 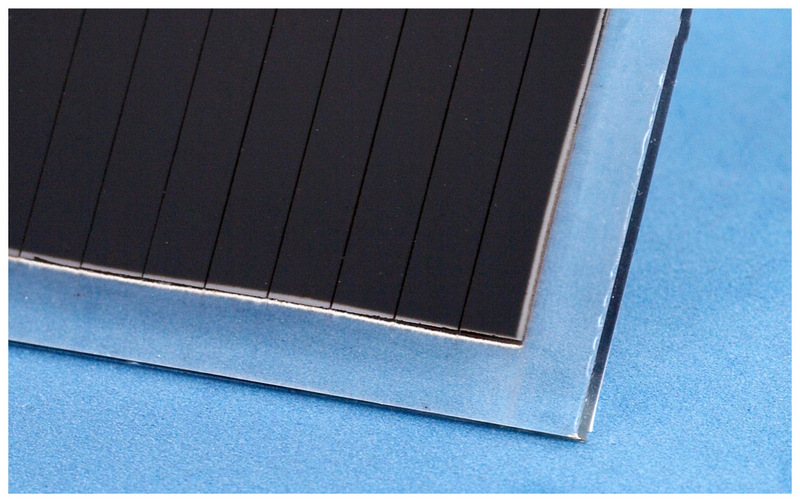 For electrical isolation and hermetic sealing of thin film solar module, the complete layer staple on the edges of glass substrate has to be fully removed. For this kind of edge deletion InnoSlab lasers with short pulse length and rectangular top-hat beam is the most efficient choice, because the deletion process can be realized in a way shot by shot with minimum overlapping and scanning perpendicular to the long edge needs lower scanner speed comparing with square beams. Edge deletion of thin film solar module with rectangular top-hat beam.